You can sell digital files on The Game Crafter. Why would you want to do that? You may want to sell a print and play version of your game. Or you may use The Game Crafter to make maps and GM screens for your RPG, and now you can sell a PDF copy of the handbook as a complete kit. You may be a Tarotist who uses The Game Crafter to sell your decks, but you want to include a meanings PDF to people who bought the deck. There is an endless number of reasons you may want to include some files with your game, or as a game. There you can upload files and designate whether they are to be given away free or only available after the game has been purchased. When users browse your shop page they’ll see the list of downloads available with the game, and whether or not they have to buy the game to get access to the files. Can I sell completely digital games, such as a print and play board game or an RPG that is just a PDF with no printed components? What kinds of files can I sell? Right now you can sell PDF, JPG, and PNG. We may add others in the future, based upon feedback we receive. Does the same 70/30 profit sharing split apply? Yes. However, designer rewards may make that as much as 85/15. So does that mean that digital sales still count toward designer rewards? Do I have to sell digital files as part of my game? Can I still provide free downloads as part of my game? Yes. However, you’ll do that via downloadable files now rather than as PDFs through the Documents page. What happened to the documents I previously set as downloadable on my existing games? They were converted to downloadable files. I see that all of my existing purchases have been added to my Games Purchased page. Does that mean that if digital files are added to those games I’ll get access to them? Yes. You’ve purchased the games so you’re entitled to everything that goes with them. If designers want to sell new stuff separately, then they’ll have to create a new version of the game. When I buy a physical game that has digital files, when can I download the digital files? Do I have to wait until the physical game has shipped? You can download them immediately after purchase. However, if you download the digital files you’ll no longer be able to cancel the order. This is in place to prevent fraud. This way someone can’t buy the game, download the digital files, and then immediately cancel the order, thus getting the files for free. What’s to prevent a person who has bought the game from sharing the URL to download the files? Nothing, but the URL checks the privileges for the user, and is personalized to each user, so we’d know who did it; and the URL is only valid for a short period of time. For all these reasons it shouldn’t be a problem. What’s to prevent a person who has bought the game from sharing the files after download? Nothing. Piracy is one of the problems with digital files. There’s no amount of DRM that cannot be overcome once the file is in the hands of the user. The video game industry and music industry have each spent billions of dollars to fight piracy, and both have lost. If someone wants to pirate a file, they will pirate it. Google contains a wealth of info about defeating every DRM system on the planet. The only ones that are reasonably secure require a persistent connection to the internet, which works great for video games on Steam, but not so much for other types of files. Luckily most people aren’t pirates. 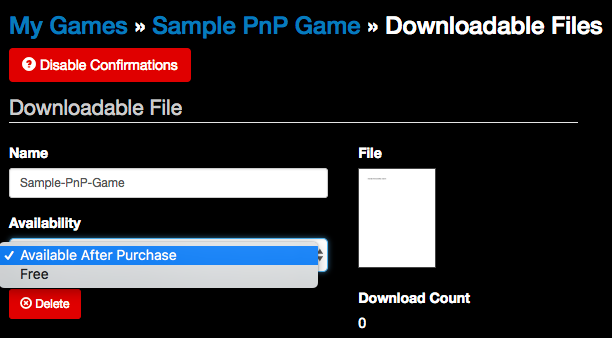 If I want to publish a print-and-play game or a downloadable file, do I have to purchase it first? No, there is no purchase requirement to publish a download-only game or file.